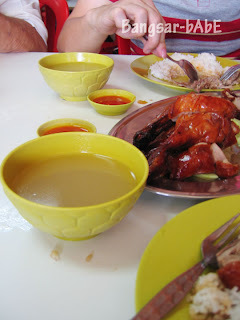 I felt like having roast duck for lunch one Sunday so I asked rif to take me there for lunch. We got there around noon and the place was packed like sardines. Had to wait for 20 minutes before we got to SHARE a table with an elderly couple. 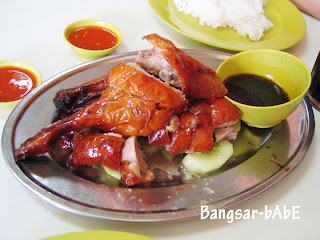 Ordered half a duck and iced herbal tea to drink. Our duck took approximately 30 mins to arrive at which point I was famished and had almost finished my drink. The duck was roasted till its skin became golden brown and crispy. The meat was tender with a layer of fats that melts in your mouth. 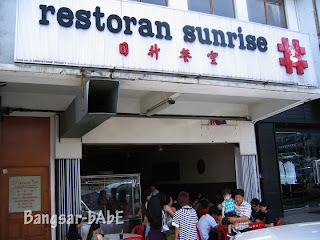 If I’m not mistaken, we paid RM 26 for the meal including drinks. I wasn’t too impressed with the roast duck the way I was a few years back. I blame this on Four Seasons, Bayswater as they seriously serve the best roast duck ever!! 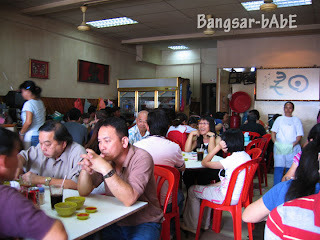 If you don’t believe me, just ask anyone who’s eaten there…they will say the same thing. Verdict: Not the best roast duck but one of the better ones around. 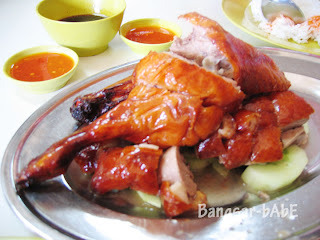 Yes base water duck is better, but the thing i dont understand about “Malaysian” ducks is that why cant they de-bone it like in UK? I think it would taste much nicer then.